Manny Farber is an American painter and film critic, born in 1917 in Douglas, Arizona. He taught at the University of California San Diego. In Negative Space, a collection of his film essays, he writes on the virtues of "termite art" and the excesses of "white elephant art." In an essay originally published in 1962, he eloquently champions the B film and under-appreciated auteurs, which he felt were able, termite-like, to burrow into a topic. Bloated, pretentious, white elephant art lacks the economy of expression found in the greatest works of termite art. 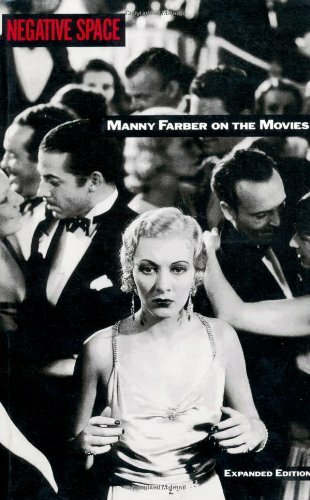 From the 1940s to the 1970s, Manny Farber's criticism surfaced in The New Republic, Commentary, Film Comment or The Nation--scouring a reader/ viewer. His unique and acid sensibility owed less to lit. crit. and more to action painters. His unusual smashing of the reader into the screen becomes the title of his collected volume, Negative Space, after the three types of space possible: "(1) the field of the screen, (2) the psychological space of the actor and (3) the area of experience and geography that the film covers." Ninety-eight percent of film criticism was and is still composed with a bulletlike, single-minded persuasive railroading effect--judgement pure and/or simple. Farber's voice read more like point-blank sawed-off buckshot, flying madly into the screen and embedding in it, burrowing into, out and around filmic material, as something experienced and immediate. This crosshatching was accomplished in "The Power and the Gory" (co-written with his wife, Patricia Patterson), where he exalts, probes, crucifies and lauds Taxi Driver, sometimes in the space of two sentences, drawing out the contradictions in its formal approach to politics, women, Hollywood, power, gun fetishes. His 1950 essay on John Huston has one of the earliest and insidious uses of the word "camp." --By Edward Crouse, Negative Space Man, from the October 11, 1999 issue of the Metropolitan. "The problem of interpretation ...": authorial and institutional intentions in and around Kiss me deadly (2000) by Richard Maltby re-examines the critical location of Kiss me deadly, arguing that its strategies of incoherence, contradiction and allusion result in large part from the circumstances of its production and exhibition. The essay discusses the history of the movie's encounters with the Production Code Administration, the Legion of Decency and the Kefauver Senate Subcommittee investigating juvenile delinquency. By considering the cultural status of the paperback book industry in general, and the works of Mickey Spillane in particular, the essay also explores the limits and possibilities for the adaptation and exploitation of a Spillane novel in the mid-1950s. (84) Robert Warshow, "The legacy of the 30's," in The immediate experience (New York: Atheneum, 1970), 34; Dwight Macdonald, "Masscult and midcult: II," Partisan review 27, no. 4 (Fall 1960), 630; Greg Taylor, Artists in the audience: cults, camp, and American film criticism (Princeton, NJ: Princeton University Press, 1999), 27, 47. (85) Taylor, Artists in the audience, 37. (86) Farber, "Underground films," 14, 16. (87) Farber, "Underground films," 14; Farber, "Blame the audience," (1952) in Negative space, 55. (88) Farber, "White elephant art vs. termite art (1962)", in Negative space, 135, 144. (89) Taylor, Artists in the audience, 15. (90) Taylor, Artists in the audience, 15. The saddest thing in current films is watching the long-neglected action directors fade away as the less talented De Sicas and Zinnemanns continue to fascinate the critics.